The Spanish biotech sector is relatively young in comparison with the industry world leaders. Nonetheless, Spain has been able to develop a dynamic biotech ecosystem by combining all the necessary ingredients to foster the emergence of new projects, their development and growth into success cases. The Spanish biotech ecosystem comprises large university hospitals where cutting-edge research is carried out; important research centres and technology centres where basic and applied projects are carried out; universities that ensure education, research and the transfer of the results of such research; small spin-off and start-up companies led by entrepreneurs who develop their pipeline through the funds raised with venture capital investors and public funds; and larger companies result of different growth models and with commercial capabilities, among other key stakeholders. This report aims to be a proof of the good state of health of the Spanish biotech industry and a demonstration of its degree of maturity. The number of scientific publications, the patents generated, the spin-offs founded, the closed financial rounds and the liquidity events that have taken place in the last years are a clear sign of this reality. This report describes a total of 20 success cases of the Biotechnology Sector in Spain in the last 10 years. 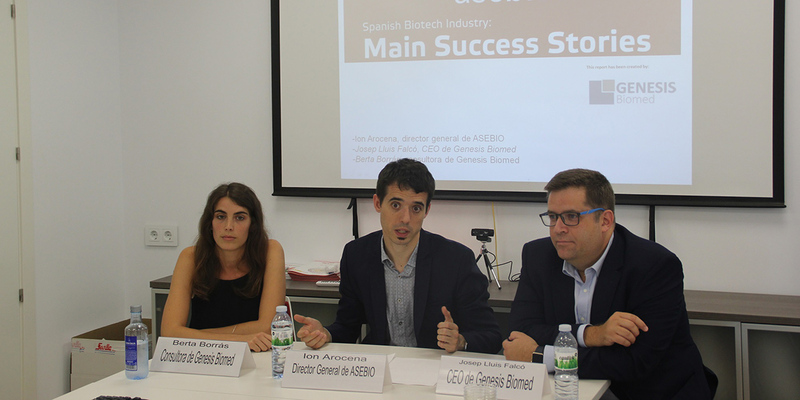 These success stories have been carefully selected by a cross-sectorial jury representing the main stakeholders involved in the Spanish Biotech sector. The selection process has intentionally included success cases from the main three application areas of biotechnology: namely red (healthcare), green (agriculture and food industry) and white biotechnology (industrial uses). Although it may sound obvious, it is necessary to say that the aforementioned successes would not have been possible without hours and hours of work, effort and sacrifice of researchers, entrepreneurs and their teams. All of us who work in, or with, this particular industry, are well aware of the passion the professionals of the Spanish biotech industry devote to their projects in a tough environment of high uncertainty, long development timelines and high investment requirement. For each project that succeeded and met its maximum potential, many failed or did not reach their expectations. But this does not mean that the experience was not worth the try. The experience gained by the teams that failed to accomplish success, the lessons they learnt, were recycled back into the industry. In fact, these early failures provided some of the building blocks for the success stories shown in this report. This report aims to highlight some of the success stories of the Spanish biotech industry during the last years. Being a short list of 20 success stories, many other could not be included even though they probably were also high quality success cases. Nonetheless we believe that this selection of 20 cases will help all of you, specially those who are foreigners and wish to gain insight into what is going on in the Spanish biotech industry, some insight into the opportunities Spain can offer to international investors and industrial partners looking for collaborations.